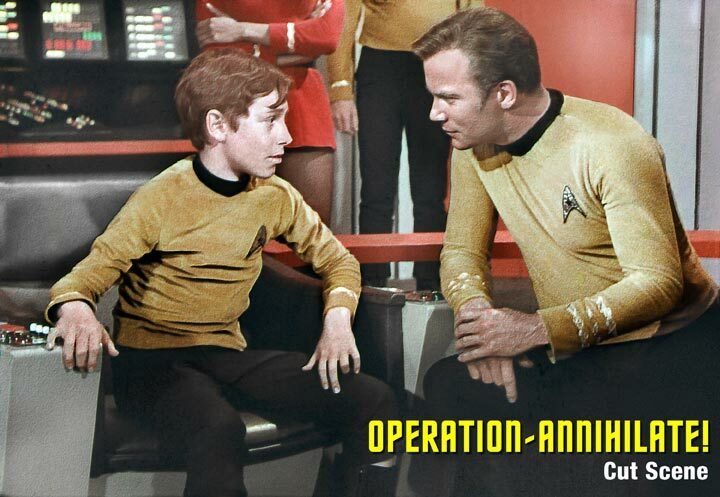 In the Star Trek TOS episode "Operation - Annihilate" we find out that James T. Kirk's nephew, Peter is one of the survivors of the Deneva Colony. Both his parents were killed by the parasite creatures so what happens to Peter Kirk? Are there any canon answers to this? Within canon, the answer is that we don't know his fate. The boy isn't mentioned again. We do learn from a deleted portion of the script that he returned to the planet to live with an adoptive family rather than moving to Earth. The boy Peter is now bright and well, dressed in a small version of the Enterprise uniform. He is smiling up at Kirk as the Captain lays a hand on his shoulder. KIRK: You’re sure you don’t want to go back to Earth to live with your grandmother? PETER: I’m sure, sir. Dad thought Deneva here is the best place in the whole galaxy. KIRK: Well, your father’s partner said he and his wife always wanted a boy. KIRK: (nods) No one ever is, Petey. (pats on shoulder) Run along; they’re waiting for you in the Transporter Room. He’d first become acquainted with Sarek through the Vulcan’s writings and speeches, some of which were mandatory reading at Starfleet Academy, where Peter was currently a senior cadet. Then, when he’d attended a talk the diplomat gave at the Academy two years ago, Peter had found Sarek’s approach to diplomacy so interesting, he’d studied the ambassador’s eminent career during his spare time. Having met the ambassador’s son many times gave his interest a personal aspect. Well, Peter mused, things had worked out well enough for someone who’d lost his parents tragically at the age of seven. Has Captain Kirk ever been to London? Did Captain Kirk underact when he found his brother dead? What happened to the Enterprise crew after TOS? In Star Trek what is space normal speed? Why does Captain Kirk wear green in the DS9 episode Trials and Tribble-ations? Do we know exactly where Kirk will be born?